Youth Choral Festival, Darien High School. We're just back from a tour which included the ACDA meeting in Cincinnati ( Matt's report on that is in a prior post, below) several concerts in Ohio, then on to the ACDA Western division conference in Tuscon. 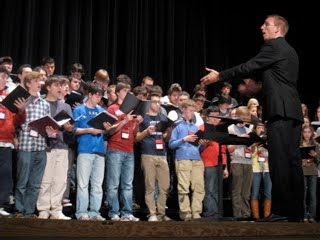 Right after that we headed back east to Connecticut for our annual concert in New Canaan followed by a Youth Choral Festival hosted by Darien High School in Darien, Connecticut. Both Fairfield County, Connecticut events are under the auspices of our board member Dudley Roski.